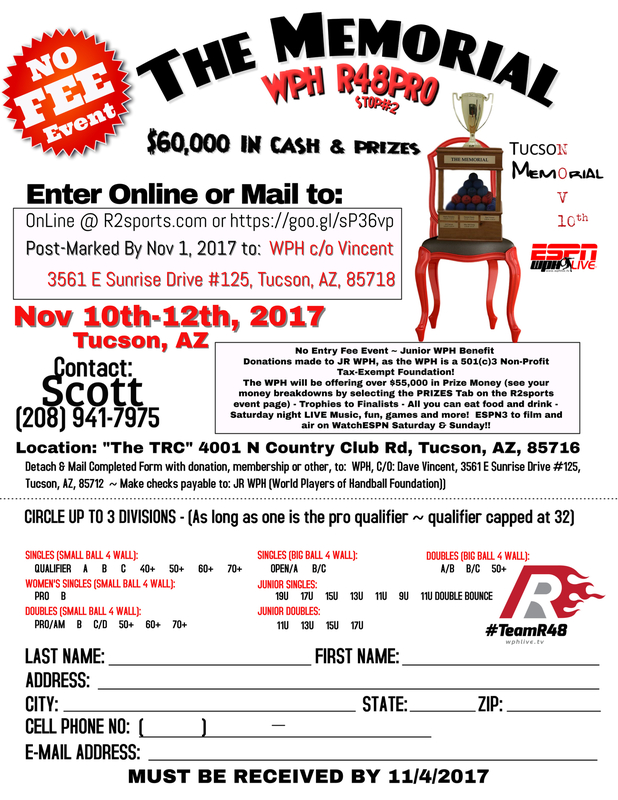 As the Tucson Memorial & WPH R48Pro Stop #2 nears, November 10th-12th, 2017, we have comprised a list of answers from questions asked throughout the past few weeks. This is such a big event with moving parts that could keep any schedule-keeper busy. Hopefully below, we can answer some of your questions. Keep in mind, most of these answers are all available to you by using your Tabs on the event webpage, HERE, to include Hotel, Fees, Divisions Offered, Club Address, Prize Money and more! Why: WPH is honoring those handball players that have passed in years past, plus those that were close to the WPH that left us this year; more specifically, WPH Cameraman, Ben Manning and former Board of Director, David Chapman. This event is also a JR WPH Development Charity tournament where all donations or funds raised will go to developing the game of handball. (Read about the Memorial) (Read more about Junior WPH). The Memorial trophy will be on display inside the Clubhouse for those that want to pay respects to Ben Manning, Dave Chapman, plus the names already on the trophy or others that were close to the handball community. Times for remembering and celebrating will be from 10am-8pm Friday and Saturday, with limited times available Sunday. Special Memorial celebration will take place between the men’s pro semifinals on the main court from 5:30pm-6:00pm (approx time) on Saturday night (to air on ESPN). Registration: This is a rare event where you do not have to pay to play. It is a free tournament with no entry fee. Although the WPH does ask for a donation from each person in attendance, that donation goes toward Junior Development. Anyone can play and registration is either on line or with paper. Deadline to enter is November 2nd. If you have family members or friends that want to support the event, but not play, then please have them register on line as a Non-Player. Their registration will bring them continuous food and Tournament Souvenir, plus some Show Court Viewing. A player can play in three events only if one of those events is the small ball pro qualifier (Pro qualifier begins Thursday, see below under Qualifier, for more details). Food, Hospitality & Live Band: Provided by “Conflicted” Jim Verhaeghe (Breakfast), the TRC & WPH Board of Directors w/continuous food being offered from sunup to sunset on most days. Continuous food ends at 3pm on Saturday, as the outdoor lawn will first bring a Open Cash Bar, then Saturday night BBQ @ 6pm ($15 per person) just a few feet from the handball courts. Live Music by Desert Reggae Band, Rilen’Out! will be on the lawn (in the WPHLiveTV/Tucson Rolling Shutters Gazebo) just after the food starts. Bringing family members? We ask that you make a small donation to the WPH for those wanting hospitality as part of their visit. Those that are registered as a Non-Player can have the luxury of knowing that they will be treated just like a participation in the event. Go Here to register, then select Non-Player. Following the BBQ, WPH will hold a fun Mixed Doubles Pickleball tournament and/or Mixed Doubles Handball Tournament and have Ping-Pong challenges. Junior Clinics and Games: Saturday JR WPH Clinics for youth and collegiates at 2:30 pm w/JR matches starting at 3 pm. WPH will track the Team Juarez vs. Team Tucson (Fred Lewis Foundation) matches and include as part of the Battle of the Border. Sunday, JR matches start at 9 am w/JR matches ending at roughly 12 pm; where potential Battle of the Border matches could occur between 1p-3p (possibility of adding pro players and coaches for a fun doubles) – Do you have a junior player that wants to be involved? Contact David Fink @ Fink@race4eight.com. 1pm Sunday, Battle of the Border Cup presentation to winning team, w/pictures of the juniors with their medals. TRC Club Rules: The Tucson Racquet Club is a private club, behavior rules are based on Club Administration’s Rules. The TRC has a quick trigger and low tolerance on rudeness, behavior issues, excessive drinking, unmonitored children, loudness, etc. We expect everyone to be on their best behavior. Although the club allows fans and friends into the facility, this doesn’t mean everyone has full access to the facility. Players only can access the Handball Club House, Lawn, Restaurants; Non-members CANNOT access the Swimming Pool, Tennis Courts, or Basketball Courts (and more). No outside food or drink is allowed into the club; the TRC has a full service bar on campus and only 100 feet from the Handball Clubhouse. TRC serves Breakfast, Lunch and Dinner. R48/WR48 Rules: Eyewear mandatory for practice matches and in competition. 1-strike and you’re out rule. Referee Clinic (Friday): Mandatory for ALL RANKED PROS, as USHA Rules Chairman Tom Sove will be leading two referee’s clinics on Friday, November 10. 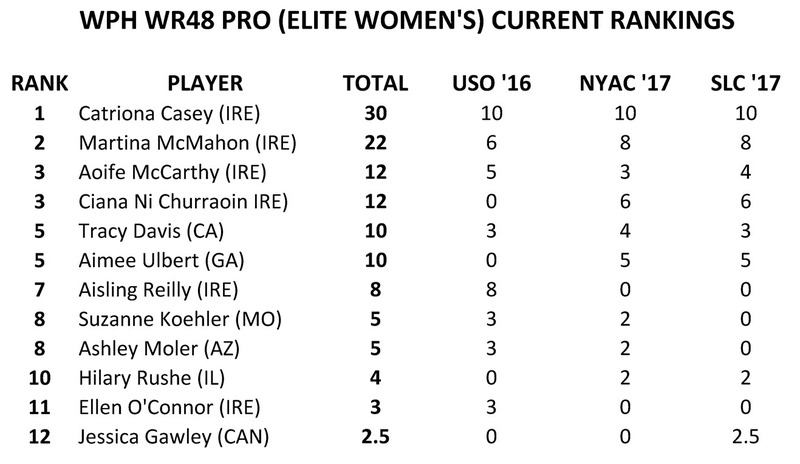 Each clinic will be the same and all ranked pros are required to attend one, or forfeit any prize money earned at The Memorial. The clinic times will be 10am and 1pm. Please let David Fink know which clinic you will be attending. This clinic will help all of the pros and administrators to better referee matches, from dealing with stalling to calling hinders and avoidable hinders and everything in between. Thursday Night Manning Cup & Standby Qualifier: WPH will hold a special Manning Cup team competition on Thursday night, November 9, to honor the loss of our film crew member Ben Manning. This is not mandatory, but will be a lot of fun. Hoping to field teams from Tucson, LAAC, Ireland, NYAC, Olympic Club, Canada, Mexico and more (Already confirmed are Team Mexico, Team Canada, Team Tucson). Men’s and Women’s pros will be part of the teams. There will be singles and doubles. All matches will be one game. This will be a great way to warm-up for the event and represent your home city/country. The winning team will be presented with the Manning Cup, a trophy the winning team will hold for one year. All Manning Cup players will be treated to a special VIP dinner after the competition. Contact me David Fink if interested in participating (Fink@race4eight.com). The Manning Cup will start at 4 pm on Thursday, November 9; soon after, the WPH Standby Qualifier will kick off with either one or two players being inserted into the 44-person qualifier Friday Morning. By entering the Standby Qualifier, it will be your last chance to get into the Pro Singles Bracket. Big Ball (WallBall) 4 Wall Pros: Big ball will invade the TRC and so will the pros. Samzon Hernandez, Timothy Gonzalez, Shorty Ruiz, Chava Cordova and more will put on a show that you will not forget. Come get into one of the most exciting brackets that the game has to offer.